Imagine a world where shoppers had to pick one item — and one item only — to last the rest of their lives? Nine out of 10 of Us would opt for the anything-but-basic white T-shirt. Whether it’s oversized, cropped, knotted at the bottom, off-the-shoulder or with pockets, white tees are the gateway to good style. In efforts to save shoppers from the browsing struggle, we’ve gone ahead and found the white tee that ends all other white tees. Not only does it master the art of effortless styling, but it will be that white T-shirt we can always count on. See it: Grab the Express One Eleven Double V Relaxed London Tee for $30 at Express! The story is always the same. We’ve spent the entire day perfecting an outfit in our mind for that upcoming special occasion. So much so, it feels as if we’ve spent literally forever on it. Rome wasn’t built in a day, neither should our outfits! Starting with the base, we reach for our trusted white tee. We have plenty to choose from, but the comfort we get from that one plain basic T-shirt is always thrown off when we realize it’s wrinkled, stretched out, or stained (the worst case scenario). If not wrinkles or stains, the problem usually is a more unidentifiable factor, revolving around the fit of our treasured T-shirt. The tee just doesn’t seem as good as it was before. Express One Eleven Double V Relaxed London Tee is the Hail Mary for shoppers looking to avoid this very familiar scenario. The relaxed London tee is essential when cultivating the ultra cool-girl wardrobe everyone strives for. The supersoft fabric looks as good as it feels. 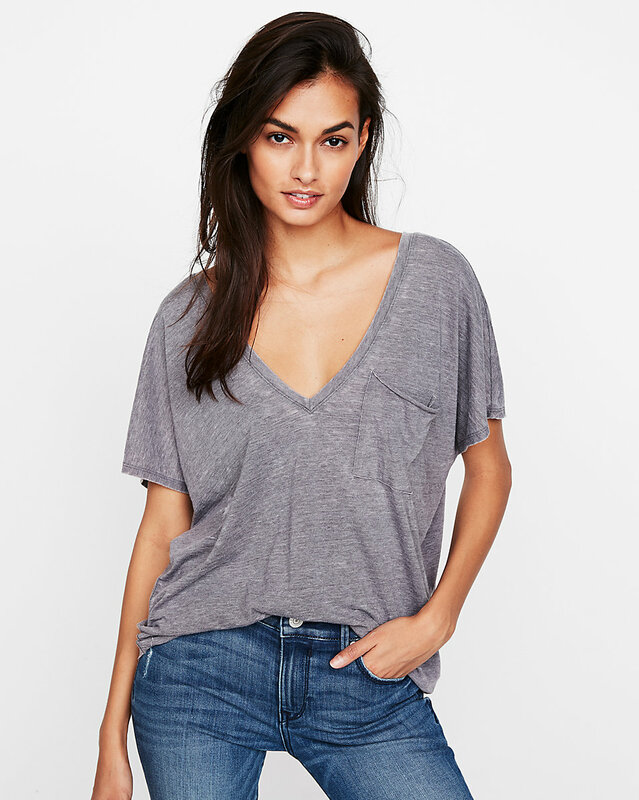 The relaxed London tee is designed with an uber cool V-neck and back. Talk about chic! The semi-sheer, extra plush material gives off that light, dainty feel. Please note, while it is semi-sheer it isn’t too sheer enough to show anything unwanted! The hi-lo hem makes this ever so versatile when styling. Whether it’s tucked in for a more put together concept or left out for a more relaxed look, the options are endless! Lastly, it is machine washable, which means it is super easy to clean and equates to more opportunities when wearing it! In terms of colors, the relaxed London tee is available in true white, as well as, slate grey. The only thing better than our starter T-shirt? Our back-up tee! Whether shoppers are looking to style the relaxed London tee under their favorite knit sweaters, with a knot at the bottom for a workout, tucked in with a skirt or go completely rogue wearing under formalwear, the relaxed London tee is beyond transitional! While the reviewers cannot note enough positive remarks about the relaxed London tee, it is important to point out some apparent disclaimers. In terms of sizing, many reviewers recommend shoppers to take note on the fit. Reviewers love the oversized, comfortable look but are mindful to size up or down depending on the desired fit. Shoppers looking for a fitted look should size down and those looking for a more oversized feel should keep their current one. Additional reviews have just as much insight. A few go on and on about the endless styling options and how it’s a staple throughout all seasons. Amazing! Others express their dismay that it is available in only two shades and not ten. We sympathize! Most noted? The feel. Almost all reviewers cannot say enough positive remarks on just how amazing the tee feels so, so soft! Reviewers claim that this is the most perfect T-shirt, and we can’t help but agree! Those looking to hop on the bandwagon, the relaxed London T-shirt it is. We guarantee all shoppers will slay in this white tee! See it: Grab the Express One Eleven Double V Relaxed London Tee for $30 at Express! Not your style? Check out other tees at Express.com!